IT stormed the box office in September 2017, smashing box office records, pleasing critics, and quickly washing away the bad taste of so many poorly wrought Stephen King adaptations like the current of a suburban neighborhood sewer. Move over Ernest Hemmingway! Beat it Dr. Seuss! The Stephen King adaptation is a hot commodity in Hollywood once again. Sure, those aforementioned authors have had their books adapted less than half as many times as the works of Stephen King. With so many adapted works from the same prolific storyteller, many of them are sure to be bad. And that is the case with Stephen King. If you grew up in the 80s, you might even remember that a Stephen King movie was not anticipated with the kind of must-see attitude of today's audiences. Many laughed off the notion, believing that if it was a Stephen King movie, it must be bad. But as IT reminded audiences, they don't have to be! And some never were. Amongst the many adapted works of Stephen King, there are some true masterpieces. And most of them are available to watch right now on any number of streaming services. 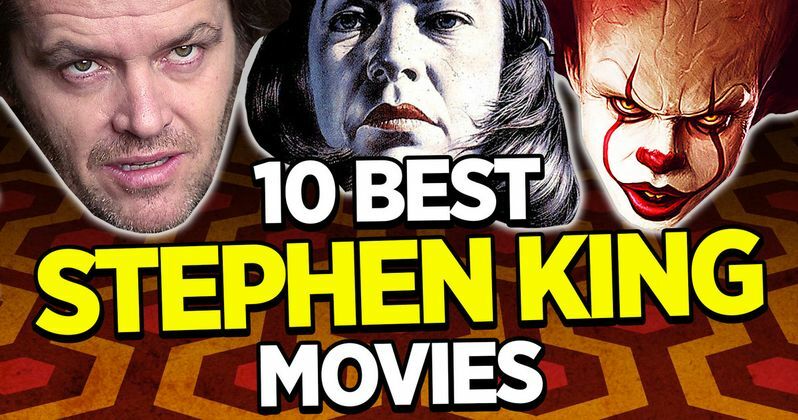 So, we take a look at the 10 best Stephen King movies to ever arrive at the cinema. And we start with one of the best, about a psychic teenage girl whom you've probably heard a lot about. Trust us, that old dancing clown Pennywise has got nothing on Carrie. Let's start with Stephen King's breakthrough book, the one his wife famously rescued from the wastebasket after King had thrown his first few pages away! Carrie is a cinematic classic on a number of levels, with so many major talents involved. It was directed by Brian De Palma years before he made Dressed to Kill, Scarface, or The Untouchables. It starred Piper Laurie as one of the scariest repressive parents of all time. And of course, Carrie featured Sissy Spacek in the title role as a bullied telekinetic teen. Most of all, there's that now iconic scene, masterfully rendered. The rite of passage that is the high school prom would never be the same after Carrie. Creepshow holds a special place in the hearts of most of us behind-the-scenes at MovieWeb. Some may be surprised to see it on this list given that it's a bit uneven, but hey, it's an anthology film! It's bound to be that way! Creepshow united King with the master of zombies, the late George A. Romero, for a pre-code comic bookish series of yarns filled with simple scares and pulpy premises. One of the Creepshow stories even stars the author himself, in one of the anthology film's strangest stories. Can you imagine a world where the President of the United States is an authoritarian ruler whose brinkmanship threatens the world's very existence? Well, that's the future Christopher Walken is trying to avoid in The Dead Zone, where he squares off against Martin Sheen under the wise direction of David Cronenberg. The Dead Zone came out between Videodrome and The Fly, a worthy entry in the filmography of Cronenberg and Stephen King, no matter what you may have heard! Stephen King loves to write about writers, from The Shining to Secret Window. 1408 is no exception. It's even got a hotel and a paranormal driven descent into madness. John Cusack does away with his goofy likability from Better Off Dead. He discards the neurotic ruminations of High Fidelity. He's full on crazy guy here. It rules. No offense to Rocky Horror Picture Show star Tim Curry, who made a fantastic Pennywise back in the day. One can argue that the TV adaptations of It and The Stand weren't all bad, considering the benefits of longer form storytelling. But the OG version of It just pales in comparison to the masterwork that broke box office records in 2017, a movie that adapts the first half of the book with terror and charm. Did we mention how much Stephen King loves to write about writers, particularly writers in dire circumstances of their own creation or from outside forces? Kathy Bates earned an Oscar for her portrayal of the worst kind of super fan in Misery, years before online trolls brought the best and worst of fandom to the surface. Writer, director, and producer Frank Darabont had a particular Midas Touch with Stephen King adaptations, parlaying less horror filled and more contemplative King tales like The Green Mile into critical and box office gold. The Shawshank Redemption is arguably the best of these, rightfully earning seven Oscar nominations, for Best Picture, Best Writing Adapted Screenplay, Best Cinematography, Best Original Music Score, Best Film Editing, Best Sound Editing, and Best Actor, for Morgan Freeman, brilliant opposite the also great Tim Robbins. While we're talking about Frank Darabont helmed Stephen King movies, we're picking The Mist over The Green Mile, simply because it turned out better than it had any right to be. How can The Green Mile go wrong, what with Tom Hanks and that fantastic performance from the late, great Michael Clarke Duncan? The Mist and its almost singular supermarket setting give it a great sense of cabin fever and claustrophobia. It's pretty much a straight up horror movie, especially compared to Darabont's other two King movies. Plus, its killer cast includes one of the Punishers, Thomas Jane. Again by no means is the Stephen King library filled with nothing but horror. Even 'though it's based on a novella called The Body, which does involve a dead body, Stand By Me is a baby boomer coming age story, the tone and vibe of which has been borrowed by everything from The Wonder Years to Stranger Things to, well, It. It was the first adaptation of King's non-horror work and a move away from comedy for director Rob Reiner, the man responsible for This is Spinal Tap and When Harry Met Sally. Wil Wheaton, Jerry O'Connell, the late River Phoenix, and MovieWeb favorite Corey Feldman all shine here, along with supporting player Kiefer Sutherland. This pick may be controversial for some Stephen King diehards, given its divergence from the source material and the author's own displeasure with many of its choices. I mean, who wants to see Scatman Crothers die? And who got his awesome poster? But when it comes to desecrating King's work, let us look no further than The Lawnmower Man or The Running Man, two movies that have basically nothing to do with the stories from which they jacked their titles. The Shining? It's one of the greatest, most debated, most atmospheric, and terrifying films ever made. Seriously, if you haven't watched it in a while, turn on this Stanley Kubrick masterpiece tonight. Forget about the "Here's Johnny" scene, there's so much more to marvel in. We know there are other solid Stephen King movies, like Dolores Claiborne with Misery's Kathy Bates; Apt Pupil from Bryan Singer starring his future Magneto, Ian McKellen; John Carpenter's Christine... And love it or hate it, but it's hard to knock the movie responsible for another classic from The Ramones, "Pet Sematary."